As a frequent traveler I wish airports had two separate lanes. One lane would be for people who are walking normally and are trying to get to wherever they need. The second lane would be people talking or looking at their phone who wander aimlessly around the airport like slow motion pinball. There would obviously be some sort of high voltage electric fence to keep those people from moving into the normal lane. I'm the one who introduced politics, and I wouldn't do it if I didn't think we're all the right kind of folks to allow for a range of opinions and repsect all around. Thank you for starting a separate thread. I think it's great that forum members should be able to discuss politics and get more information on different systems and viewpoints. I have had bad past experiences with two happy international forums in the past, where political views have badly disrupted the friendliness. But I believe what Jmack says is right and F-F will be fine. I will not bring this here with me, I hope you understand, I never meant to presume or criticise anyone else's choice of discussion. I am extremely iffy about this thread idea, but if it works, more power to ya! At least it's out of the King's Paws. I did a bad thing last summer.In the centre of Bristol A guy stepped out in front of me just before a junction, coffee in one hand texting with the other. Now on a bike peds who cant be arsed to look where they are going are a real hazzard in towns. Instead of beeping the horn I braked got the clutch in and and as he got 3 steps into the road revved the hell out the bike. Coffee went one way phone went the other and I got out of dodge before he had time to get angry. Bah, sounds like it was completely necessary. You did what you had to do. 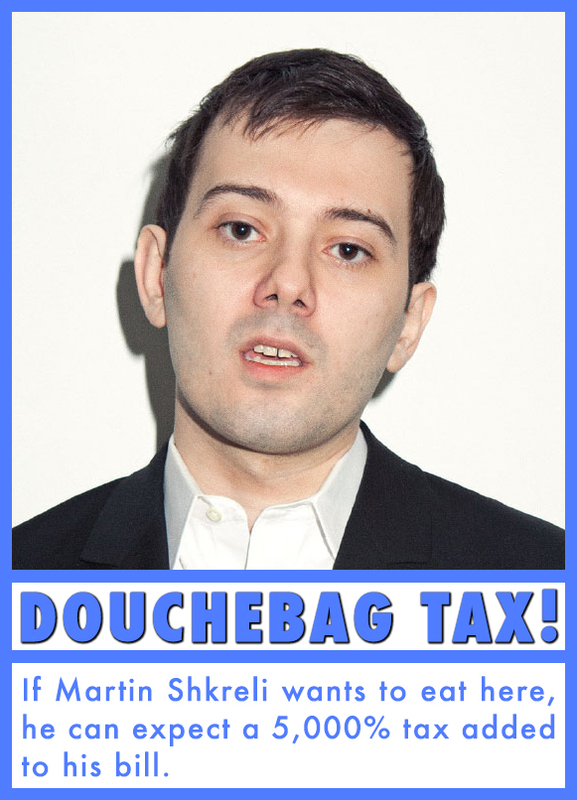 Speaking of the real word, did anyone hear about the guy that raised prices of a drug by 5000%? It went from $13.50 per pill to $750. Crazy world we live in. I hope a lot of NY's restaurants will put this in their windows. He backed down off that. If he had only raised it to $25 or even $50 he wouldn't have heard a peep. Caught a little of this but not looked into it from what I understand the IP was bought by a hedge fund and did what hedge funds do in the medical world. Looked to kill people for profit.The Sociapathic attitude is it's a TB drug America has a low incidence of TB so its only poor people elsewhere who will die. From whe I stand America looks like a very rich part of the 3rd world. It is really disappointing because you tend to be good people who deserve better. Caught a little of this but not looked into it from what I understand the IP was bought by a hedge fund and did what hedge funds do in the medical world. Looked to kill people for profit. . The Sociapathic attitude is it's a TB drug America has a low incidence of TB so its only poor people elsewhere who will die. Oh my! This really is a politics thread. Rich part of the third world... that's one I'll have to try out on some folks. It is strange, isn't it, that the land of the people, by the people and for the people fought like a tiger against unionization, human rights, women's rights, gay rights, etc. But we've gotten there/getting there on the individual rights I've mentioned. But where we fall short is any place where there is a whiff of wealth redistribution or interference with conducting business. You live in a country which holds it's population hostage through healthcare. I don't think I have ever read a more accurate statement. Student debt that can never be written off. A constitution that is being used to keep the population in check and it's protections ignored by those in power. Yup could be any third world dictatorship. We are following in your footsteps and I am well aware that the future holds little that is good for any of us. This is not an attempt to troll America or Americans. I am aware of how proud you tend to be of your Nation, but you really need to correct the idea that money is more important than anything else. @Rostum, you should really be clearer about your POV. At some point, I'll muster an argument for some fragment of American exceptionalism. But for the moment, I've had two hard ciders - which is quite enough for me, thank you. I feel like maybe I'm on track with my story (which may be the alcholhol talking thank you very much). And I have a baseball game to stumble wander over to. If you're going to watch the Orioles you may need to have several more hard ciders.